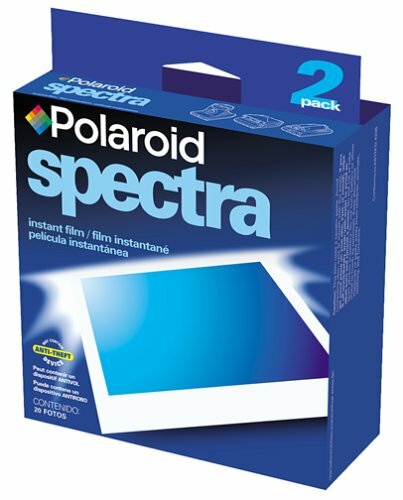 The Polaroid Spectra Platinum Twin Pack Film set comprises two boxes of the highest quality instant film Polaroid has ever made. This is a general-purpose, high-speed, medium-contrast, integral film for high-definition instant color prints. The film is balanced for daylight and electronic flash exposure. It is specially designed to bring more color and greater sharpness to your photographs faster than ever before. When Polaroid introduced the SX-70 in 1972, its self-processing "integral" film represented a major backwards step for instant color-print materials. The need for the dyes to migrate through a titanium dioxide layer before reaching the receptor sheet caused a significant loss of sharpness, as well as a creamy "bloom" in areas of fine detail against a light background (eg, bare branches against the sky). Polaroid has not been able to make an integral film that matches the overall quality of their peel-apart materials. The latter have detail and a vivid edge sharpness the integral films will probably never achieve. But the current Platinum film is unquestionably the best of its type. Color rendition is noticeably improved. Platinum film can tolerate direct comparison with the Macbeth color chart without suffering acute embarrasment. The tonal scale has been lengthened without a loss of saturation. (The 150-speed Time-Zero material has a noticeably shorter scale, often producing excessively contrasty prints.) Sharpness is better than any previous integral film (including the 150-speed), and the "bloom" is lower than ever. Nevertheless, Polaroid's integral materials do not match the overall quality of modern color-negative films. The latter have multiple layers and complex chemical interactions among the layers that allow both a wide tonal scale and high saturation. It's unlikely Polaroid films will ever be able to perform these chemical feats, so the gap between conventional and instant-picture quality will continue to widen. On the other hand, Polacolor (both peel-apart and integral) has a quality rarely seen in negative films -- it looks almost three-dimensional. There's depth -- an almost-palpable "roundness" -- you don't get from Kodacolor or Fujicolor. The latter look flat by comparison. A note about processing... Although Polaroid integral films give good results over a wide temperature range, the highest saturation and cleanest colors occur in the high 70s or low 80s. (I discovered this when I threw several developing prints on top of a warm amplifier in a cool room. The pattern of the amplifier's vent holes appeared in the print, with the areas over the holes noticeably more vivid.) A warm Spring or not-too-hot Summer day gives the brightest colors. The Polaroid Spectra Platinum is the best Instant Film I've ever used. I use this film for my Polaroid Colorshot USB Digital Printer. What I see on the screen is what I get on the film. It is the most perfect transfer of digital imaging I have ever seen. I also use the film for my Polaroid Spectra 1200si which I love as well. The photo is just as sharp as on regular film. The color is perfectly balanced and the image quality is extremely sharp.